Photo Credit: William & Wilma Follette. USDA NRCS. 1992. PLANTS database. Occurs east and west of the Cascades in montane wet meadows, Puget lowland and Willamette valley prairies and moist forested communities in southeastern Oregon (Franklin and Dyrness 1973). 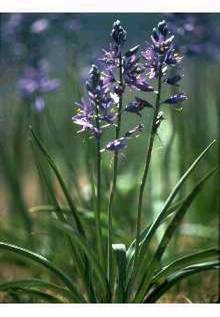 In the Intermountain region, common camas is usually found in mountain grassland and prairie communities; west of the Cascade crest, it occurs in both forest and grassland types (FEIS database). Camas seed requires 42 to 100 d of cold, moist stratification (1 to 4 °C [34 to 40 °F]) for maximum germination (90 to 100%). (Anonymous 2000) Stratification can also take place through the winter outdoors or in a cold frame after sowing seed in containers in the late fall. (Wick and Evans 2001). Seeds, container grown seedlings, transplanting salvaged or commercially grown bulbs, bulb offsets. Anonymous. 2000. Propagation protocol for production of Camassia quamash plants; Pullman Plant Materials Center, Pullman, Washington. In: Native Plant Network. URL: http://www.nativeplantnetwork.org (accessed 9 May 2003). Moscow (ID): University of Idaho, College of Natural Resources, Forest Research Nursery. Anonymous. 2001. Propagation protocol for vegetative production of field-grown Camassia quamash plants; Pullman Plant Materials Center, Pullman, Washington. In: Native Plant Network. URL: http://www.nativeplantnetwork.org (accessed 9 May 2003). Moscow (ID): University of Idaho, College of Natural Resources, Forest Research Nursery. Franklin, J. F. and C. T. Dyrness. 1973. Natural Vegetation of Oregon and Washington. Oregon State University Press, Corvallis. Hitchcock, C. L. and A. Cronquist. 1973. Flora of the Pacific Northwest: An illustrated manual. University of Washington Press, Seattle. Wick, Dale; Evans, Jeff. 2001. Propagation protocol for production of container Camassia quamash (Pursh) Greene ssp. quamash plants (164 ml (10 in3) Leach Cone-tainers); Glacier National Park, West Glacier, Montana. In: Native Plant Network. URL: http://www.nativeplantnetwork.org (accessed 9 May 2003). Moscow (ID): University of Idaho, College of Natural Resources, Forest Research Nursery.